TagBand Skin Tag Removal Kit Review: Micro Device Tool Working? TagBand Skin Tag Removal Kit Review: Micro Device Tool That Work? “Beauty is in the eye of the beholder”, or so the expression goes. That being said, many people would like to look good at all times, which is unrealistic unless we are that 0.01% of people who have great genetics. If you are someone who has skin tags on visible areas such as face or eyelid, it may shake your confidence or even affect your self-esteem. Does this tag remover really work? 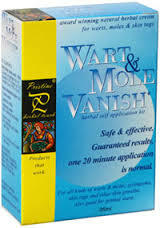 How is it compared to other product like Wart Mole Vanish skin tag removal kit? How Does Micro TagBand Skin Tag Removal Device Work? You’ve heard about all kinds of ways to remove skin tag, from using apple cider vinegar home remedy to liquid nitrogen treatment. So micro TagBand is one more remover to add to your arsenal so that you can figure out whether it’s the best option to go to for you. Micro TagBand works by using a simple, specially created band that will put itself over the impacted skin and cut off the blood supply, allowing the skin tag to fall off in a couple days, which is much faster than it would be without this product to help you. Step 1: You clean the skin around the skin tag carefully with one of the cleaning pads that are included with this kit. Clean skin means that the treatment will take effect much better, which is obviously going to be something that you are working for. Step 2: Once the skin is clean, you take on the bands and slide it onto the tube. Push one of the bands up onto the section of the cone. Attach the band remover, making sure it touches the band and push the band close to the edge of the cone. Step 3: Place the cone over the skin tag, and place the cone level with the skins surface. Step 4: Push the band remover towards the skin and pull the cone away. The band will be securely fastened to the base of the skin tag. Step 5: After a couple of days (with the blood supply cut off) the skin tag will shrivel up and simply fall off of your face, taking the band with it. Watch the video below that shows step-by-step on how to remove skin tags with TagBand tool. Tagband Review: Does It Work? What Do Users Say? The procedure are pretty simple, you have to admit, and it is going to be pain free, which is a major plus for those who are looking for this characteristic in particular. It is intended for all kinds of skin tags, though the manufacturer does not recommend using it to remove skin tags near the eyes, because it of the sensitive area of their location. The final results after the skin tag fall off are just a tiny mark where the skin tag was attached and a slight discolouration. These will eventually fade so that you won’t even be able to tell there was a skin tag there in the first place. Tag Band kit is designed for you to take care of all skin tags from small to large size, and you can easily order refills for the bands. LittleOyster shared her experience via mumsnet forum: “I’ve just used a Tagband kit from Amazon to remove one I have had on my undercarriage since giving birth. I was a bit scared about using it, but it worked really well – painless and it just dropped off at the end of the 4th day. The instructions say it’s not to be used in the eye area, but I’m sure it’d be fine if you had someone to help you band it. Where To Buy TagBand Skin Tag Removal Kit? 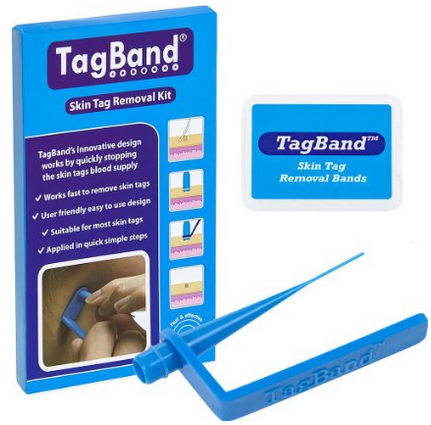 TagBand is an over the counter skin tag remover that is suitable to be used on all skin tags located on face and body. This device works by stopping the skin tags blood supply and cause these unsightly skin lesions to fall off eventually. If you want to see how TagBand skin tag removal tool stacks up against the competition out there, here is another option that is similar in its methods, the Wart & Mole Vanish Skin Tag Removal Kit. 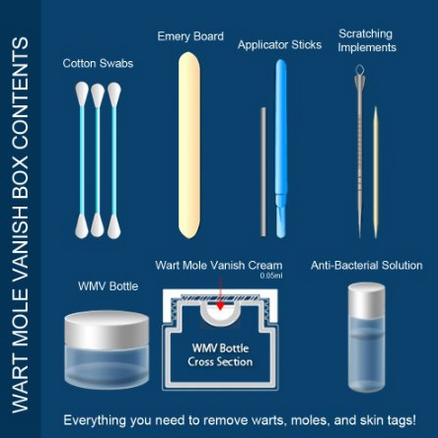 The Wart & Mole Vanish kit, as the name suggests, is intended for warts and moles, but it does come with an emery board for scratching at larger skin tags, as well as a toothpick that would be used for rubbing away at the smaller size skin tags that you have, which is used in combination with the supplied cream. Using the emery board/toothpick, you need to liven up the skin of the skin tag, and when you have allowed the base of the skin tag to show itself (in other words, you’ve chafed it down to the root of the tag itself), you should carefully mix up the Wart & Mole Vanish cream and apply it to the skin tag, leave it on for 20 minutes (stinging is normal), then carefully wash it off. The skin tag should be brown and scabbed over, leaving it fall off on its own shortly after. As you can see, different methods and different speeds of results, depending on what you’re looking for. ← Best Antihistamine for Hives: Zyrtec vs Allegra Benadryl Claritin… and Alternatives?